The coyote is a species of canid found throughout North and Central Ameica, ranging from Panama in the south, north through Mexico, the United States and Canada. The color of the coyotes pelt varies from grayish brown to yellowish gray on the upper parts, while the throat and belly tend to have a buff or white color. 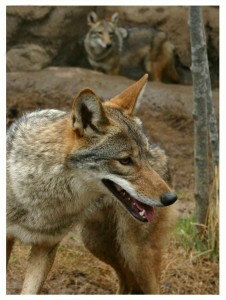 Coyotes typically stand 24 to 26 inches tall at the shoulder and weigh from 15 to 46 pounds. Though coyotes have been observed to travel in large groups, they primarily hunt in pairs. Typical packs consist of six closely related adults, yearlings and young. Coyote packs are generally smaller than wolf packs and associations between individuals are less stable, thus making their social behavior more in line with that of the dingo dog of Australia. Conservation Status: Federal status not listed. With declining wolf populatons coyotes have greatly increased their range which includes most habitat types in North America. Despite being extensively hunted, the coyote is one of the few medium-to-large sized animals that has enlarged its range since human encroachment began. It originally ranged primarily in the western half of North America, but it has adapted readily to the changes caused by human occupation. Coyotes thrive in suburban settings and even some urban ones. They have adapted well even in densely populated urban environments in Chicago and New York while avoiding contact with humans.